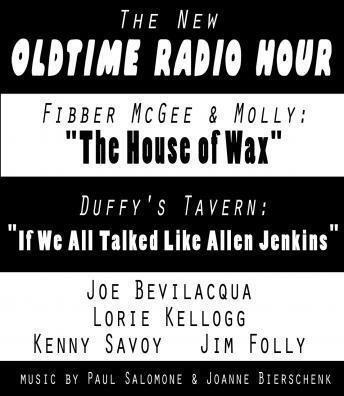 The New Oldtime Radio Hour: "Fibber McGee" and "Duffy's Tavern"
Listen to "The New Oldtime Radio Hour: "Fibber McGee" and "Duffy's Tavern"" on your iOS and Android device. OTR fans rejoice! Tired of listening to the same shows? Here are two NEW OTR stories, Produced with wonderful sound effects and music by veteran radio theater producer Joe Bevilacqua, and performed Liquid Comedy: Joe Bevilacqua, Lorie Kellogg, Kenny Savoy, and Jim Folly, with Aundrae Dair, and music by Paul Salomone (piano) and Joan Bierschenk (bagpipes). This hour of comedy was recorded before a live audience at SUNY Dutchess in Poughkeepsie, New York on March 20, 2007. Fibber McGee and Molly in ""The House of Wax""
It's 1953 when Throckmorton P. Gildersleeve makes a less than triumphant return to Wistful Vita to introduce Vincent Price at the Wistful Vista Bijou premiere of the 3-D movie ""The House of Wax"". Meanwhile, Fibber tries to save five cents by making his own 3-D glasses. Teeny, Mr. Oldtimer, Wally Wimple, Mrs. Uppington, Harlow Wilcox, and even Fibber's closet... are all there in this brand ""Fibber"" tale! Duffy's Tavern: ""If We All Talked Like Allen Jenkins""
Archie, Finnegan, Eddie, Miss Duffy and all the gang are back ""where the elite meet to eat"" in this first new ""Duffy's Tavern"" outing since 1952. Archie tries to lure the Shriner's Convention to the tavern with promises of big stars he can't deliver, not knowing the real Warner Brothers movie actors Edward G. Robinson and Allen Jenkins are hiding in the kitchen.